In Las Vegas you’ll find much more than just casinos and nightclubs. The buzzing city also offers heart-pumping activities like gun shooting. 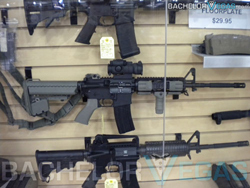 Of course, Machine Guns Vegas (MGV) isn’t your ordinary gun range. 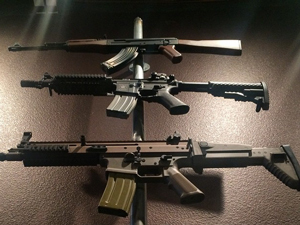 Here you’ll find an incredible assortment of guns found only in a military training facility. No matter your experience level, you’re sure to get an instant thrill the moment you pick up a piece of authentic military weaponry. Open daily from 9 AM to 6 PM, MGV is the ultimate place to spend the day or celebrate a bachelor party or other celebratory event. 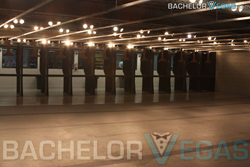 Machine Guns Vegas has plenty to offer, from their 10,000 square foot luxurious indoor compound to their VIP Gun Lounge with two private firing lanes, private entrance, and complimentary refreshments. You’ll also find 10 safe and secure shooting lanes where customers of all skill levels can practice shooting in the safety of the compound. Experienced range safety officers are available to ensure everyone remains safe. You also have access to free transportation to and from your hotel. Reservations can be made online and gun packages are available so you can save a few bucks as you enjoy an afternoon of shooting. 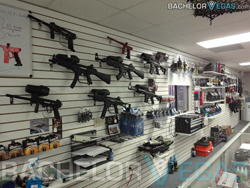 You’ll find a variety of gun choices at MGV, from full-auto and semi-auto to pistols and shotguns. All guns are available to shoot individually or as part of a package. All guns and ammo are also completely authentic. The minimum age to shoot is just 10 years old; however, height, weight, maturity, and other factors may come into play. Never shot a gun before? Don’t worry. The expert staff at MGV will tell you everything you need to know. You can even bring along some friends to watch you shoot for a small observation fee to cover ear and eye protection costs. Prefer to do your shooting outdoors? 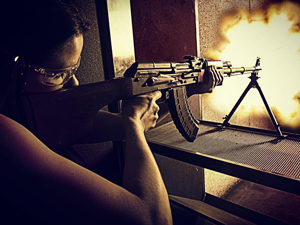 Machine Guns Vegas also offers an outdoor package that allows you to shoot some of the facility’s most legendary firearms in a safe area outside. Whether you’re interested in long distance shots or want to work on close encounters, there is a gun for every type of training. The outdoor shooting package can be found in the heart of the Mojave Desert and usually ranges between two and five hours. Try gun options such as a suppressed sniper rifle, full auto Glock, or Sterling SMG. You must make a reservation if you wish to participate in the outdoor shooting. 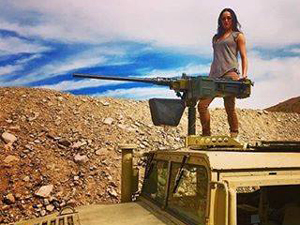 For the ultimate shooting experience, ask about the machine gun helicopters (MGH). This is the only experience in the world where civilians can shoot a M249 (SAW) belt fed machine gun or M60 belt fed machine gun from a helicopter. Great for large groups or parties, this activity is available once in the morning and once in the afternoon and requires a briefing and rehearsal to ensure the safety of all customers. You must call or book online if you wish to shoot from the helicopters and teens between age 15 and 17 are welcome if accompanied by an adult. There is a gun package for everyone at Machine Guns Vegas. Whether you’re interested in The Seal Team 6 Experience where you can become a member of the famous special operations and combat units, or The Gamer’s Experience that lets you take your favorite games like ‘Call of Duty’ or ‘Battlefield’ to the next level, there’s something everyone will enjoy. There’s even something for the ladies. The Fatale Experience consists of a pink M4, MP5, and Glock 17. If you want the ultimate gun shooting experience, head to Machine Guns Vegas on Aldebaran Ave in Las Vegas. Been to Machine Gun Shooting?